Spoiler Alert: If you’re scared of clowns, skip this post and check out another. Or come back later for some Style, Kicks, Clothes and Fashionably Fantastic posts. 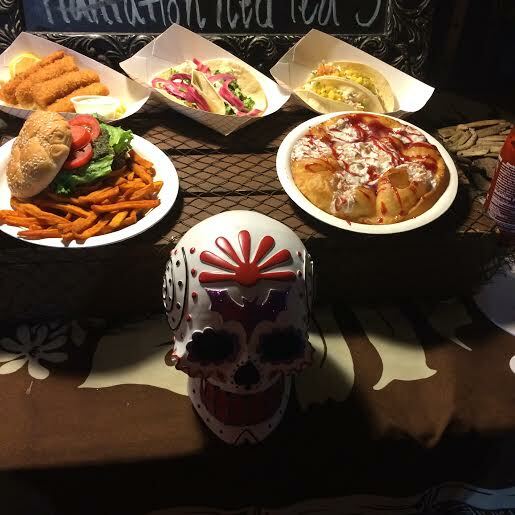 Friday October 31st – Halloween 2014, Eat the Street in Honolulu celebrated Dia de los Muertos. The Day fo the Dead. Which is celebrated Halloween thru November 2nd. I was there and took a few pictures of the costumes. At this event, some of the biggest costumes included: Where’s Waldo, Teenage Mutant Ninja Turtles, Batman and his crew of buddies and villains, Day of the Dead painted faces, and One Super Scary Clown from Stephen Kings It, with the same name as the Punk-Alt band-Pennywise. With that Ultra scary clown on American Horror Story keeping me up nights. I will post this scary clown, but probably be too scared to ever look at him again. He did win first prize for the scariest costume at this Eat the Street Event. Enjoy the pictures from Honolulu Hawaii-Or if you’re too scared of clowns, see you later this week at H&M x Alexander Wang and at the Grand Opening of Jimmy Choo in Waikiki. These had some mean arrow tips on them!